Richard Peters,'29 Ford roadster pickup. By'57 we had reached the era of all-out show cars, but the Ala Kart was a classic and unanimous choice to this list. Built in the Barris shop, including white pearl paint by Junior Conway and candy scallops on top and underneath the fenders by Dean Jeffries, it not only copped two AMBR trophies, but was the first actual rod reproduced in 1/25 scale, by AMT. 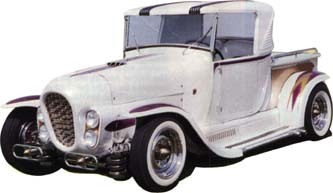 Later bought by the model company, it suffered an engine fire, was rebuilt by Barris, and eventually wound up in Phoenix, Arizona, parked outside a tire store. It has been in storage there, disassembled, for the last 30 years. We need an update on this car if anyone can fill us in or tell us the present owner.